COPE’s educational programming is designed for the person who appreciates the value of a professional education, as well as the nurturing environment of a warm, supportive classroom setting, the close camaraderie of like-minded students, passionate, personally invested faculty, and the fine-tuned sensitivity to the community’s no-compromise values and rigorous standards. Click here to learn more about COPE. Professional Career Services (PCS) was founded in 1994. The Brooklyn, New York and the Lakewood, New Jersey divisions were launched with a goal of finding employment for the many people out of work at that time. As the economy improved, the need for job placement did not disappear; in fact it grew, as PCS’s reputation for successful job placement became well known. Applicants included both entry level job-seekers, as well as experienced professionals who required retraining and placement. PCS continues to serve job applicants through direct placement services, career counseling, educational programs, and preparation for employment. PCS has become known, over the past 24 years of service, as a source for all career-related issues: local employers and small businesses throughout New Jersey and New York contact PCS for employees on all levels – clerical support through controllers, accountant, traffic managers, and health care administrators. Click here to learn more about PCS. Eliezer Martin, MS Accounting, CPA, is an unlikely brand ambassador for PCS. A good husband, a proud father, and an active member of his kehillah, Eliezer is also constantly busy with his job as CFO of a real estate management company. But he will always stop to talk about PCS. “I credit PCS with providing me with the education and knowledge to advance in my career, become a CPA, and earn a living parnassah,” he says. PCS, together with COPE, is one of the Agudah’s flagship parnassah initiatives. Though it is a multi-faceted organization, all its activities revolve around the same goal: helping people support themselves and their families. PCS, which stands for Professional Career Services, started in 1994. It focuses on three main activities. First, career counseling – what is the right job for you? Second, training – how can you get the skills to get the right job for you? Lastly, placement – let us help connect you with the right job for you. PCS can take a person from thinking their employment prospects are non-existent to empowering them to become a fully-qualified member of the workforce. A historic picture from 1880 of a laborer sitting at his Shabbos table. There is an intriguing black-and-white picture in the Agudah’s historical archives. 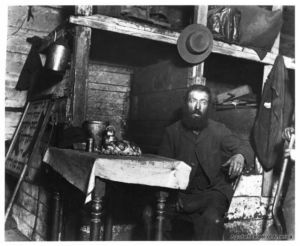 Dating back to 1880, it shows a laborer sitting at his Shabbos table on the Lower East Side. Some things about the shomer Shabbos community have stayed the same for hundreds of years: There’s a braided challah, what looks like a salt shaker, and a nice place setting. But the setting of the photo is telling. The man is sitting in a tiny room – a converted coal cellar. There’s a shovel right next to him. He looks like he lives in poverty and his expression tells us that this was the best room he was able to afford. And other things that have stayed the same for hundreds of years: Parnassah has been a challenge for our community – as it has been to the general population – for as far back as the shomer Shabbos community has existed in the United States. The Agudah has engaged with this challenge for decades, and COPE, Agudah’s first parnassah initiative, started in 1977 to teach people the skills they needed to get jobs in IT and computer programming. But it changed its focus some years back, according to R’ Daniel Baumann, COPE’s director. Big companies started outsourcing their IT positions to India and the market for programmers and IT professionals was shrinking. COPE pivoted to accounting programs. But not the traditional accounting degree path – at least, not at first. Many people have never heard of a junior accounting program. Junior accounting is a certificate program whose graduates are skilled in accounting and business, and are able to work at a high level in a professional environment. COPE graduates have gone on to become bookkeepers, entrepreneurs, CFOs, and much more. “The beauty of the junior accounting program is the number of choices it gives to its graduates,” says R’ Baumann. One of those choices is becoming a CPA. Some twelve years ago COPE saw how many of its students were interested in learning more about finance, and had the skills and the drive to eventually sit for the CPA exams. To help those students, COPE created a 150 credit degree program which students can complete in 22 months. Upon graduation, the students are awarded a B.S. in Business with a concentration in accounting, and are eligible to sit for the CPA exams. These accelerated programs allow men and women who are seeking to provide for their families in a derech kavod to learn the skills they need to be competitive in the job market. COPE graduates are very successful in finding jobs, with an employment rate of over 90%. In fact, COPE’s biggest referrers to its programs are its previous graduates. Recently, one family had its fourth child graduate from the program! Over 2,500 students have completed the junior accounting course, and about 500 the accounting degree program. “I started in COPE as an accounting instructor,” says R’ Baumann, himself a veteran accountant. “At that time COPE was only teaching 75 people a year. That means that 75 families’ parnassah each year could be credited to COPE.” Soon, though, there were problems. 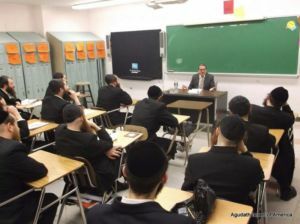 COPE’s budget was not being covered and the Agudah was reluctantly considering closing COPE down. R’ Baumann couldn’t accept that there would be 75 families the coming year who would not have parnassah because COPE closed. Taking on the responsibility for this division of Agudath Israel Community Services with the encouragement of members of the Moetzes Gedolei HaTorah, R’ Baumann made sure that this resource for Klal Yisroel stayed strong.